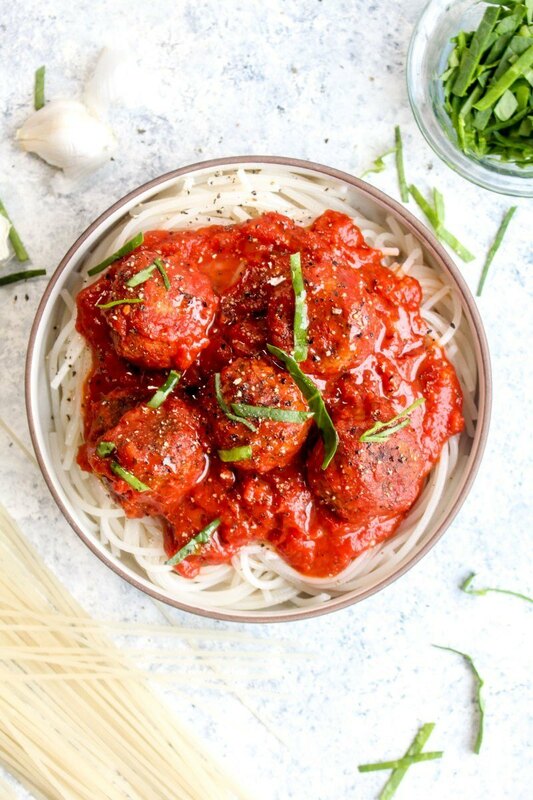 Veggie Meatballs are a healthy freezer recipe that can be on the table in 20 minutes! Made with gluten free whole grains, beans, and loaded with flavor. Preheat the oven to 350 degrees. Spray a sheet pan with nonstick cooking spray. Set aside. In a small bowl, whisk together the flaxseed meal and 2 tablespoons of water. Set aside to thicken for 5 minutes. Add the mushrooms and onions into a food processor fitted with an “S” blade. Pule until broken down into a fine dice. Heat a skillet over medium heat and add in the avocado oil. Once the oil is hot, add in the mushroom and onion mixture plus the salt. Sauté until the mushrooms have released their moisture and the moisture has evaporated, about 7-10 minutes. Add the garlic and sauté for another minute. Return the mixture to the food processor. Add in the flaxseed mixture, cannellini beans, oats, sun dried tomatoes, fennel, Italian seasoning, and crushed red pepper flakes. Process until a smooth mixture forms, scraping down the sides as necessary. Using a 2 tablespoon measure, form the mixture into round balls. If it sticks to your hands, rub your hands with a little nonstick spray. Place the meatballs onto the prepared sheet tray and bake for 25 minutes. Flip the meatballs and bake for another 20 minutes. You can enjoy the meatballs now, or let them cool and place them in a freezer friendly zip top bag or lidded container. Add a jar of your favorite sauce to a pot. Place in as many meatballs as you would like to enjoy, making sure the meatballs are covered in the sauce. Cover and gently bring the sauce to a simmer. Simmer, stirring occasionally, until the meatballs are warmed through. Serve with your favorite pasta.